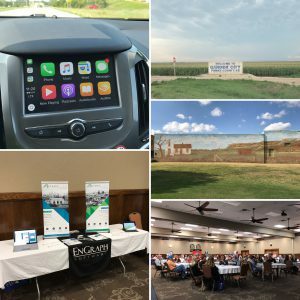 It was fun driving out here to Garden City for the Kansas Transit Conference in my rental car that had Apple CarPlay (well the sprawling plains were cool too). The visual console GUI to iMessage, Apple Music and most importantly Podcasts was very cool and easy to use. I also stopped real quick in downtown Jetmore to snap a pic of this cool building mural that blended into the actual Kansas sky. The Kansas conference (http://kstransit.org) has been great this year with lots of interaction with all the agencies. Got to see our friends - Kandace from Sedgwick County and Anne from the Flint Hills Area Transportation Agency. The theme of the conference this year was 'Growing Transit in Kansas' and we got to hear great presentations from Donna Smith (ProjectAction), Kristen Joyner (SWTA), and Jennifer Montgomery (Assistant Kansas Attorney General). Looking forward to Salina next year and smelling some of those Cozy Inn burgers!